Denmark has been the one leading nation for design since the 50’s. From furniture, toys and lighting to architecture Danish designers have been recognized over decades by their unconventionality, functionality and creativity. Knowing that Lego (the most famous and loved colorful plastic interlocking building blocks of the world) is a Danish invention, you would not be surprised that Danish architecture has also a long history of international appreciation. So what does the Parliament Building (Vienna), Sydney’s Opera House (Australia), Arch of Humanity (Paris), MoMa (New York City) and the Blue Planet Aquarium (Scandinavia) all have in common? 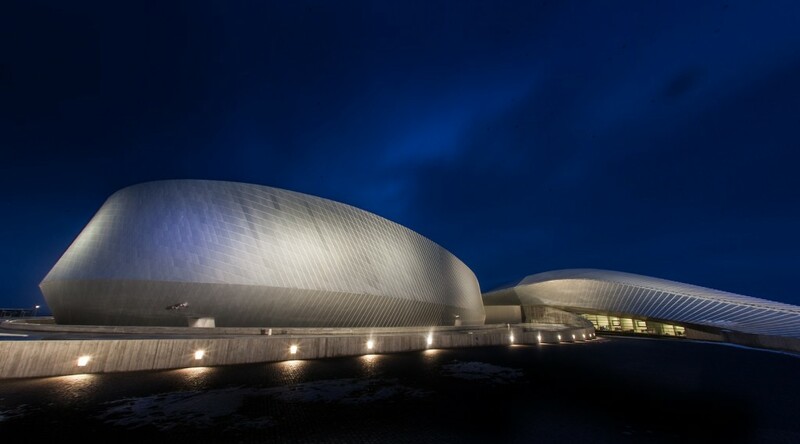 They are all iconic concepts of Danish architecture and worldwide acclaimed masterpieces! Located on an elevated headland towards the sea in the Kastrup Harbor in Copenhagen, The National Aquarium Denmark – or The Blue Planet (in Danish Den Blå Planet, Danmarks Akvarium) has not only become a landmark for the region, but it is also the winner of WAF 2013* and the largest and most modern aquarium in Northern Europe. The project was developed by 3XN and it is inspired by the spiraling patterns of movement of nature’s whirlpool**, flocks of birds, fish shoaling and water streams. The whirlpool concept brings attention to its distinctive vortex blades and for its interaction with Nature, as the building landscape changes dramatically depending on viewing angle, distance and daylight and water reflections. From the air it looks almost entirely white resembling the contours of a starfish; from the front, the building’s organic lines are evocative of silvery-grey waves or a vast sea creature; and giving a closer look to its surface there’s a facade patterning like fish scales consisting in 33,000 small diamond-shaped aluminum shingles, adapting to the building’s organic form and reflecting both sea and sky. Inside the curved and organic architecture elegantly showcases life from all waters around the globe. 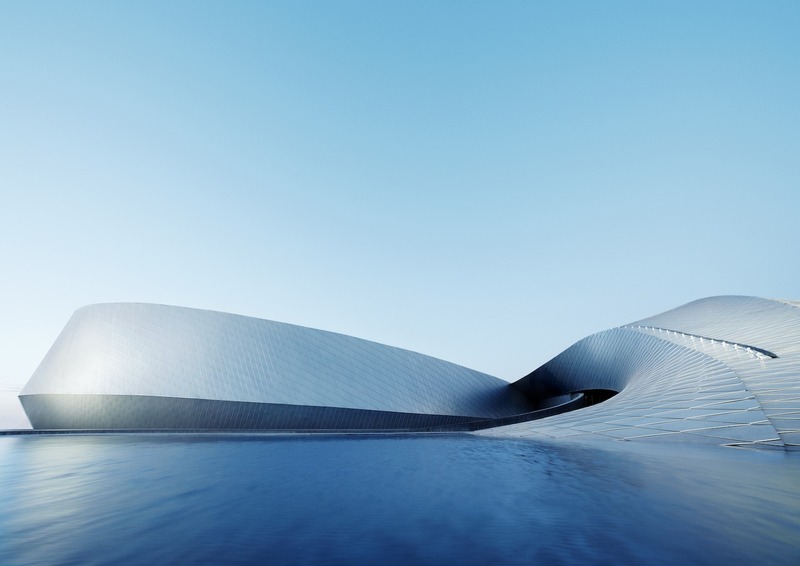 Architects brilliantly designed the building structure to give its visitors the impression of being swept under water by a whirlpool. This experience combined with underwater sound and images complete the atmosphere of being submerged under water – visiting a strange, fascinating world. The roof of the main lobby is made of glass and represents the surface of the sea, casting shimmering patterns of light across the floor of the entrance as if the sunlight has been refracted by the ocean above. 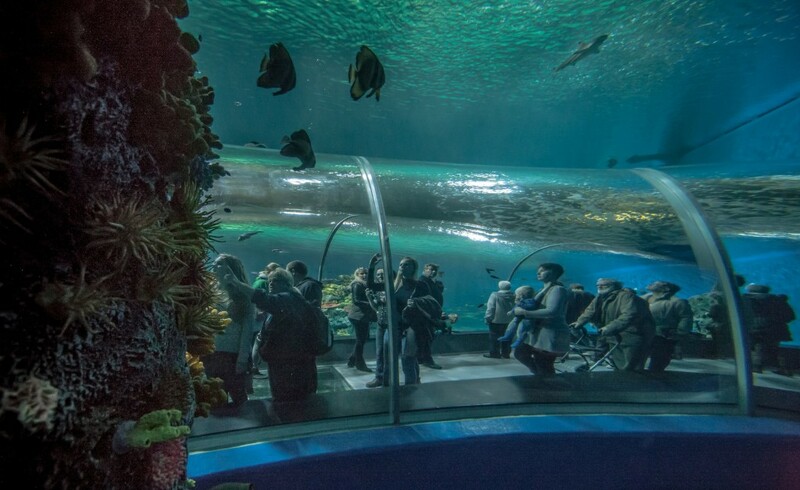 A circular foyer is the center of navigation around the aquarium, and once inside visitors can choose among its multiple routes, choosing which river, lake or ocean to explore. The interiors range from grand to intimate settings, allowing the architecture and the exhibits to jointly convey an array of diverse environments and moods. 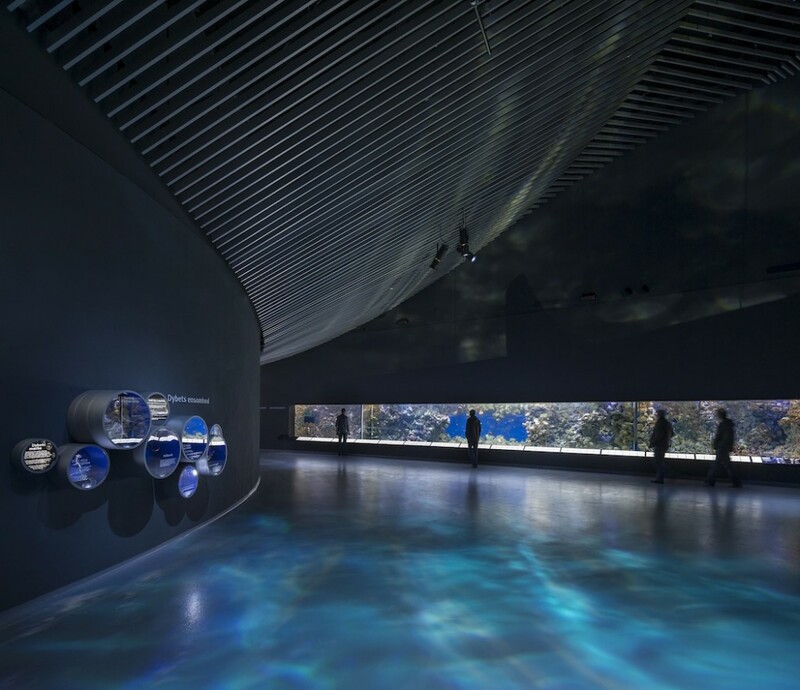 The curved ceilings of the aquarium are reminiscent of the baleens of a large whale. 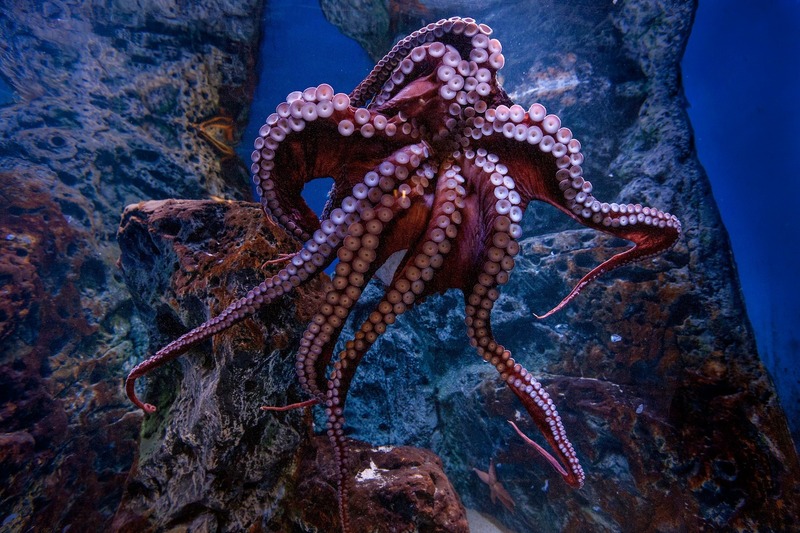 The aquarium offers a complete sensorial and captivating experience of life in and under the water. A mixture of light, sound, advanced AV- technology, projections, film, interactivity, graphics, illustrations and signs ensures that every visitor will have best experience possible. 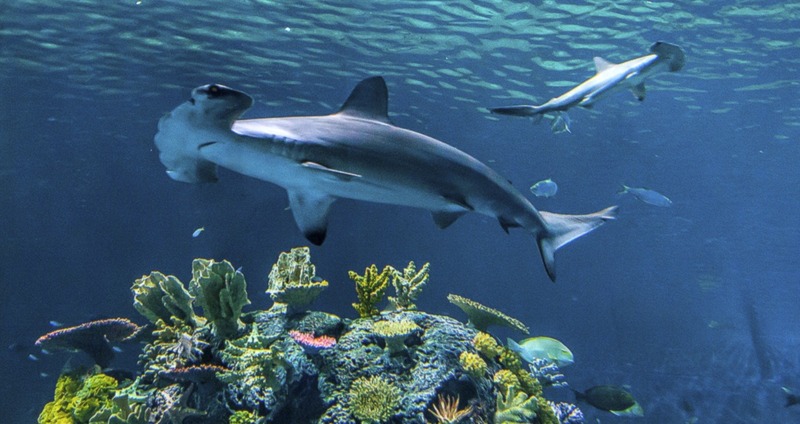 With an exhibition area of 5,000m2 divided into 8 sections and 53 aquariums and installations The Blue Planet is the home of 20,000 animals from 450 different species. 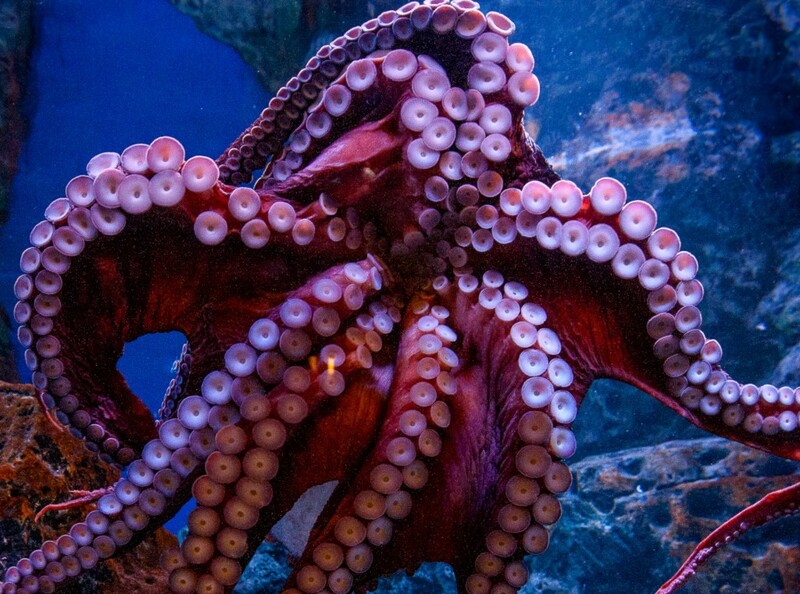 The exhibition explores waters from the entire globe presenting fascinating animals and amazing environments. 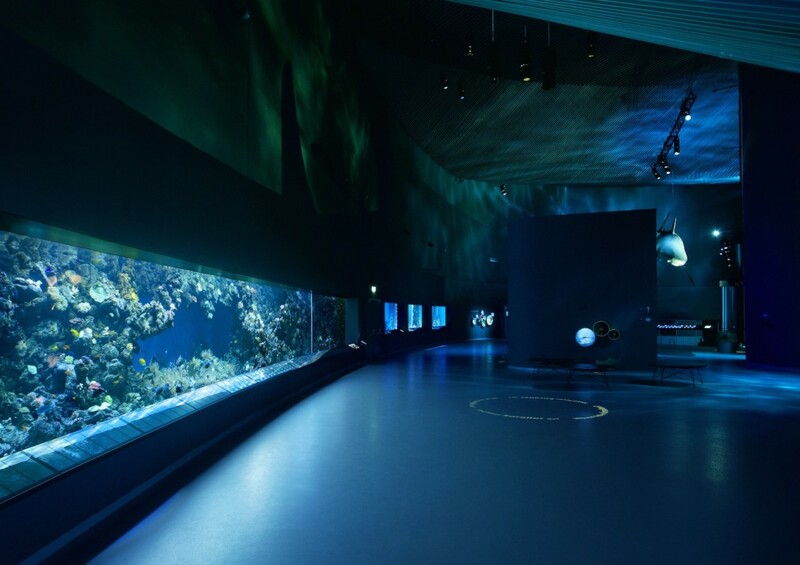 In fact, The National Aquarium Denmark is the only aquarium in Denmark that shows both cold and warm waters, saltwater and freshwater, taking its visitors to a tour from tropical oceans to the icy waters of the cold North in a total of 7 million liters of water. The Ocean Tank is the largest aquarium displaying1,300 fish in total. Hammerhead sharks, elegant rays, mystical moray eels and hundreds of small fish swim together in 4, 1 million liters of warm saltwater. 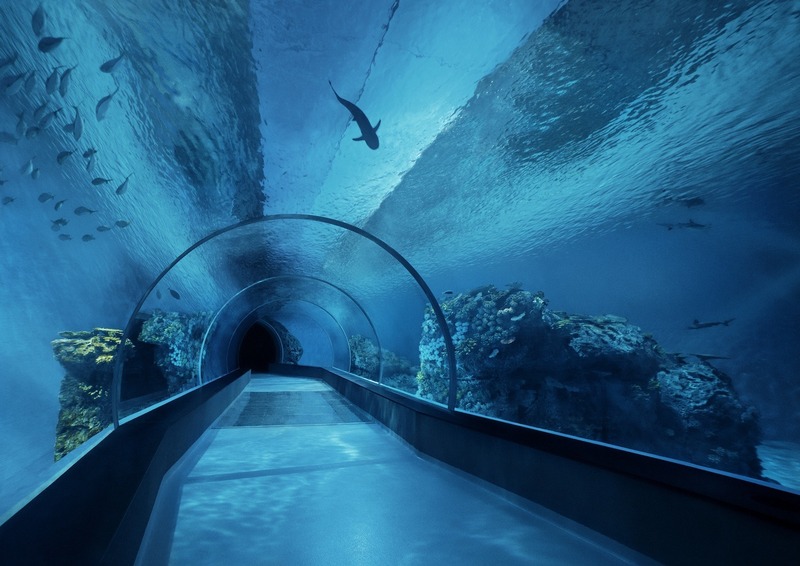 Visitors can observe the animals through a large 8 x 16 meter panorama window or from a 16m long tunnel. 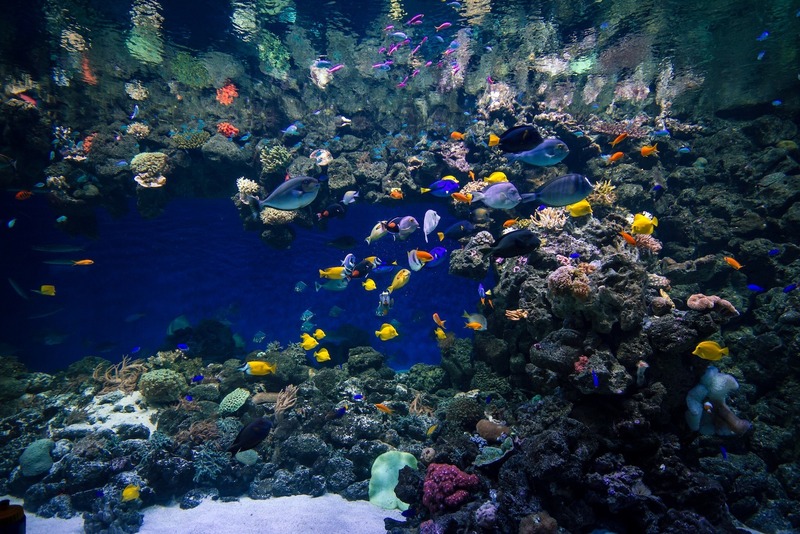 The Coral Reef aquarium displays colorful fish living in and among the corals. 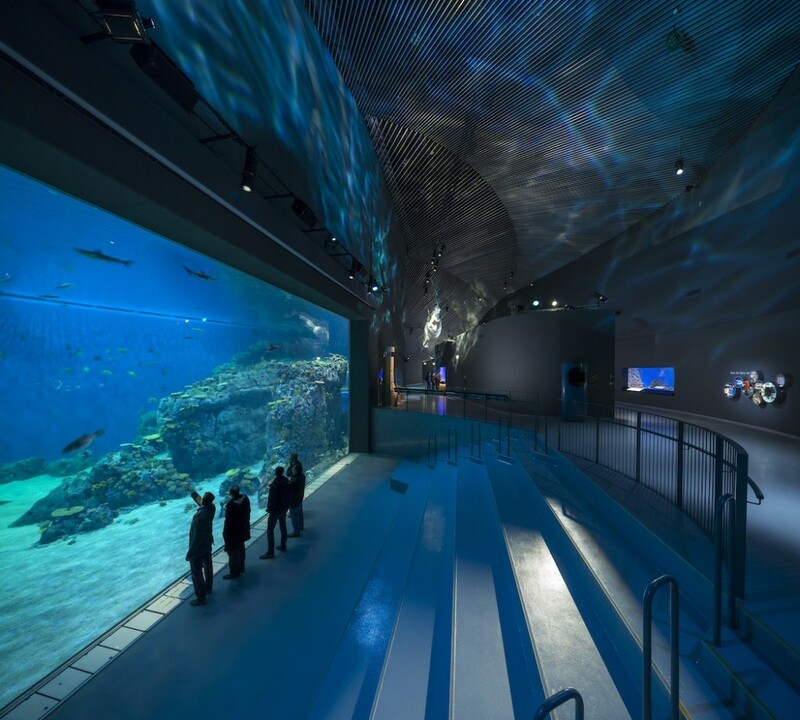 Four aquariums are combined to show the ecosystem of the coral reef. In the middle aquarium living corals are displayed on both sides with beautiful coral eating fish and in the back, predators such as bass and barracuda. The building extends beyond the original coastline, placing special requirements on the facility’s structures in a terrain with tendency to subsidence. The structure is founded on piles and all of the sewage structures are suspended in the concrete structure. The building’s architectural facade design forms the basis for the design of the steel structures. The load-bearing system consists of 54 unique steel frames, which via their radial positioning and geometry forms the base of the curved facades. The whirlpool concept was chosen as ideal not only for its visual associations, but also because it resolved a practical challenge in the design brief: It ensured that one or more of the whirlpool arms could be extended with more than 30 % in order to create more exhibition space with relative ease and without disrupting the building’s integrity nor the operation of the aquarium. A service line was built 1.7 km out into the Strait of Øresund to obtain suitable water for the aquariums. Moreover, the cooling system for aquariums and climate system for public areas also use seawater. The tanks design and construction were developed by AAT (Advanced Aquarium Technologies) and Orphek was chosen by their lighting specialist to be the supplier of LED lighting solutions for its long settled reputation in Europe. Not only that! Orphek has also proven to be the only leading company in LED lighting for aquariums with a true passion for design, developing products and solutions that not only answers to the needs of the living creatures in captive aquariums, but also able to offer solutions where the integration of light sources, conceptual design and architectural elements are desired. 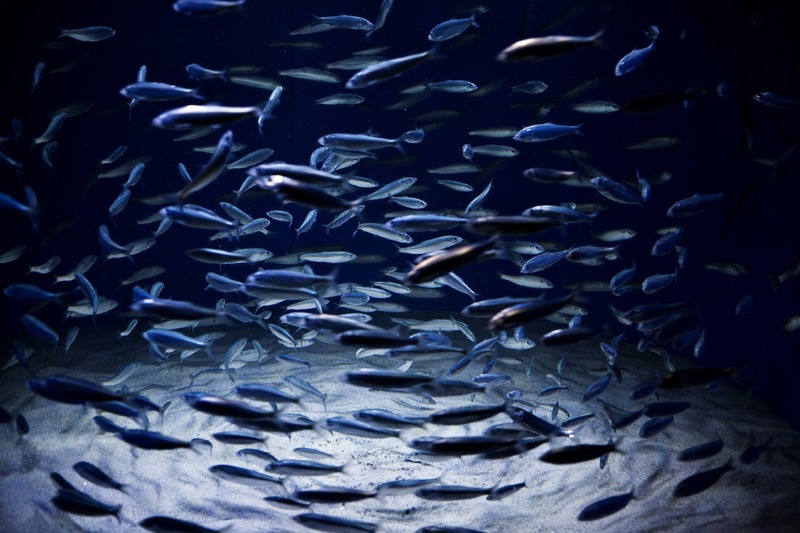 So being committed to efficiency, technological development and design Orphek proudly supply its products to The Blue Planet Aquarium. *World Architecture Festival or WAF is the world’s largest festival and live awards competition dedicated to celebrating, and sharing architectural excellence from across the globe. **A whirlpool is a swirling body of water produced by the meeting of opposing currents.